Leslie Cerier’s light, sugar-free fruit crisp made with a quarter cup of cannabis-infused coconut oil is delightful at any time of day. Infused with an uplifting sativa, it’s a healthy way to catch a moderate buzz at breakfast. Leslie mixes a quarter cup of cannabis oil and maple syrup with rolled oats, walnuts, and cashews to make a protein-rich topping for raspberries, pears, apples, and blueberries, then bakes the crisp until the fruit is bubbly. You can use whatever combination of organic fruit looks great at your local market for this crisp, and you can use frozen berries in the dead of winter. Place almonds in food processor and grind to a meal. Transfer to large mixing bowl along with oats, walnuts, cashews and salt. Mix well with a wooden spoon. Add maple syrup and oil and stir until well blended. Arrange raspberries, pears, apples, and blueberries in bottom of a 2-quart baking dish. 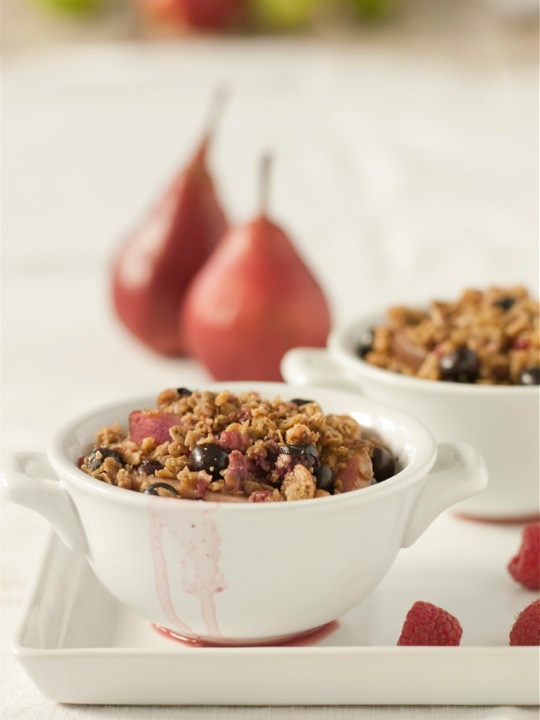 Cover with topping, pour juice on top, and bake 30 minutes or until fruit is hot and bubbly and topping is crisp.